'The End is never the End is never the...' The Piratecraft End dimension is a place where players can explore, build, and claim at their will. 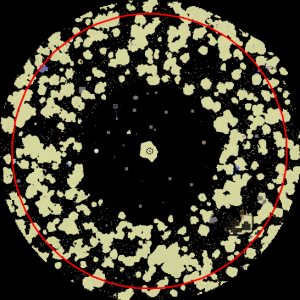 The central island is part of an admin claim in order to protect it, but farther out is fair game to players, with small settlements dotted around plus large bases from players like JUSAPlayer1 and Lawzoneon. Players can also spawn the Ender Dragon at will, by creating End Crystals and placing them on the portal. Rumours say that you can reach the End by jumping into the void in the overworld. They say, you never return. As a more simple and safer alternative, you can visit the End by typing /warp end and jumping off the floating ship. The current End was created with the release of Piratecraft V2, and has since been regenerated a few times, the last in August 2016. The end warp was made free in 2018, along with the nether. There are currently no official future plans for the End. Maybe another regeneration? Who knows! This page was last edited on 18 March 2019, at 19:46.